The Chair will honor Nobel prize winner John Hume, who played a pivotal role in the peace process, and Thomas “Tip” P. O’Neill who, as Speaker of the House of Representatives, was a major force for enlisting the United States in advancing peace in Northern Ireland. The two men worked together as colleagues and friends. 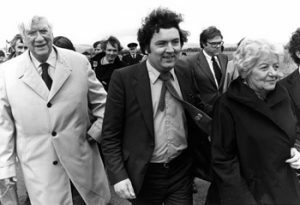 From 2002- 2009 John Hume, in his honorary capacity as Tip O’Neill Chair in Peace Studies at the University of Ulster, brought an unparalleled group of international figures (e.g. Bill Clinton, Hillary Clinton, John Kerry, Kofi Annan), to the Magee campus in Derry~Londonderry to lecture on peace.